Plasmas, the universe’s ubiquitous mixes of electrons and ions, fascinate Kathleen Weichman. Their many regimes and interactions invite exploration via computation, her preferred research tool. “Oftentimes you get behavior that seems at first like it’s counterintuitive, but then you study it more closely and you find out, yeah, that does makes sense,” says Weichman, a University of California, San Diego, doctoral candidate. With advisor Alexey Arefiev, the Department of Energy Computational Science Graduate Fellowship (DOE CSGF) recipient examines target normal sheath acceleration (TNSA), a way to produce energetic ions. The resulting beams could be useful for inertial confinement fusion (ICF), which seeks to harness the power fueling the stars. The largest such experiment is the National Ignition Facility at Lawrence Livermore National Laboratory, where powerful lasers bathe a peppercorn-sized capsule in X-rays, compressing hydrogen isotopes inside until their nuclei fuse, releasing energy. In TNSA, an intense laser pulse hits a microns-thick target, interacting with electrons on its surface and accelerating them through the back surface, Weichman says. “Now you have electrons out past the target and you still have ions in the target,” creating a strong charge separation that pulls ions out of the back surface and accelerates them. 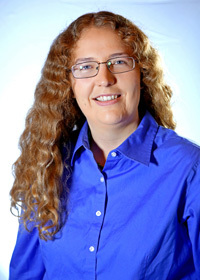 With her simulations, Weichman seeks to understand how a magnetic field changes TNSA. She uses a particle-in-cell, or PIC, code, which simplifies the problem by tracking macro particles representing from tens to millions of actual electrons and ions as they move under the influence of electric and magnetic fields. Weichman and Arefiev will compare results with the Japanese group’s data to refine the simulation and, in turn, improve the experiment. Her codes have run on Comet at the San Diego Supercomputer Center and on other high-performance machines at the Texas Advanced Computing Center. Plasma played leading roles in Weichman’s two Los Alamos National Laboratory (LANL) practicums with Gian Luca Delzanno. In 2016, she focused on cold atmospheric plasma (CAP) containing moderately energetic electrons and room-temperature ions. It’s attracting attention because it kills bacteria and cancer cells but spares healthy tissues. It’s unclear how CAP does it. Delzanno wanted to explore one idea: electrostatic pressure created when depositing a charge onto a surface. Weichman developed models that accounted for previously neglected factors and found the present means for generating CAP could produce sufficient electrostatic pressure to destroy bacteria but not cancer cells. The researchers hope to publish a paper soon. In 2017, Weichman examined a ribbon-shaped stream of neutral atoms at the solar system edge, first observed by a LANL-designed instrument aboard NASA’s Interstellar Boundary Explorer (IBEX) probe. IBEX examines the outer heliosheath – the area where the bubble of particles our sun ejects collides with low-density plasma in the interstellar medium. Physicists think neutral solar wind particles passing into the outer heliosheath undergo a charge exchange, becoming ions. Under certain conditions, the charged particles gyrate around interstellar magnetic field lines before undergoing a second charge exchange, becoming neutral again, and streaming toward Earth. “It’s this bright ribbon of emission that we think corresponds to where the interstellar magnetic field is roughly tangent to the heliosheath,” Weichman says. Weichman, Delzanno and Vadim Roytershteyn of the Space Science Institute addressed an unanswered question: whether the distribution of ions circling the magnetic field is stable. “It’s an extremely difficult, computationally expensive problem,” because the interaction timescales range from fractions of a second to two years. Weichman is applying a new approach: the Spectral Plasma Solver, a code Delzanno and colleagues devised. It can bridge the gap between disparate time scales and has already allowed the researchers to confirm that the system is unstable. The researchers plan to stage new simulations that will address whether the instability saturates at a level consistent with the observed ribbon feature. It seems inevitable that Weichman will land at a national laboratory after graduation in 2020. She’s been familiar with the system since childhood, when her father worked at Sandia National Laboratories’ New Mexico facility. She also did lab internships as an undergraduate and as a graduate student before she received the DOE CSGF. Image caption: Simulation of a proton beam produced by target normal sheath acceleration (TNSA) with a kilotesla-level magnetic field. A relativistic laser pulse accelerates electrons from the front surface of a thin plastic target (black). After traveling through the target, these electrons (blue) accelerate protons (purple) from the rear surface. The magnetic field results in well-collimated TNSA protons. Credit: Kathleen Weichman.